October market stats were published by the NWMLS today. Home prices were basically flat from September, and inventory dropped a bit but was up dramatically from 2017. Sales continued to slip from last year as well. September’s year-over-year listing growth was an all-time record at 68 percent, but October’s 86 percent blew that out of the water. 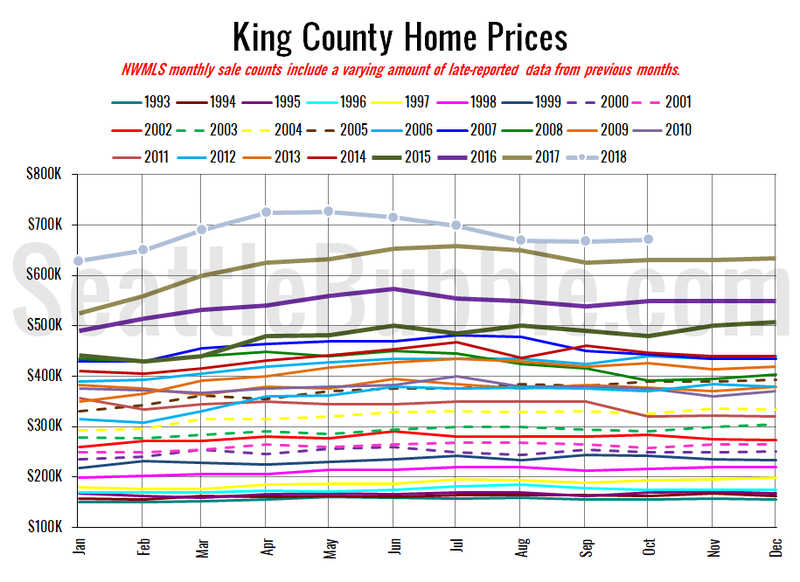 The NWMLS hasn’t published their press release yet so let’s just get right to the data. Inventory fell seven percent from September to October, and was up 86 percent from last year. 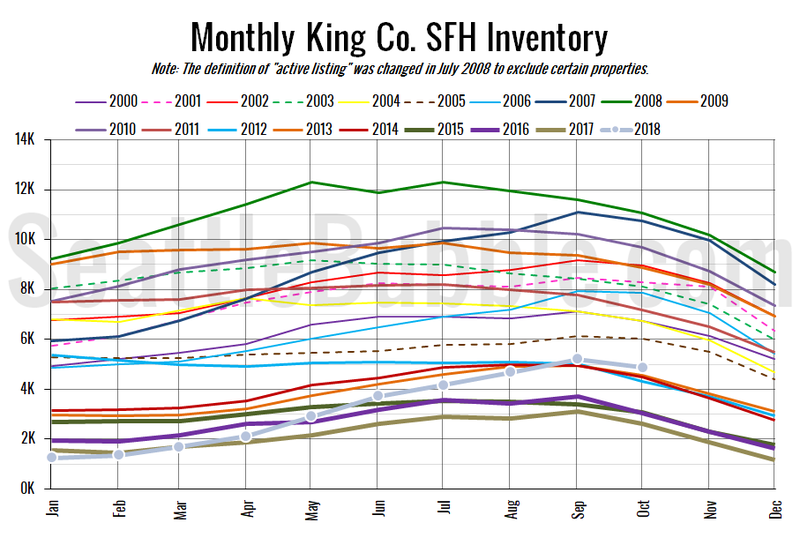 Before this year, the highest year-over-year inventory gain was 61.3 percent way back in February 2008. The number of homes on the market was at its highest October level since 2011. 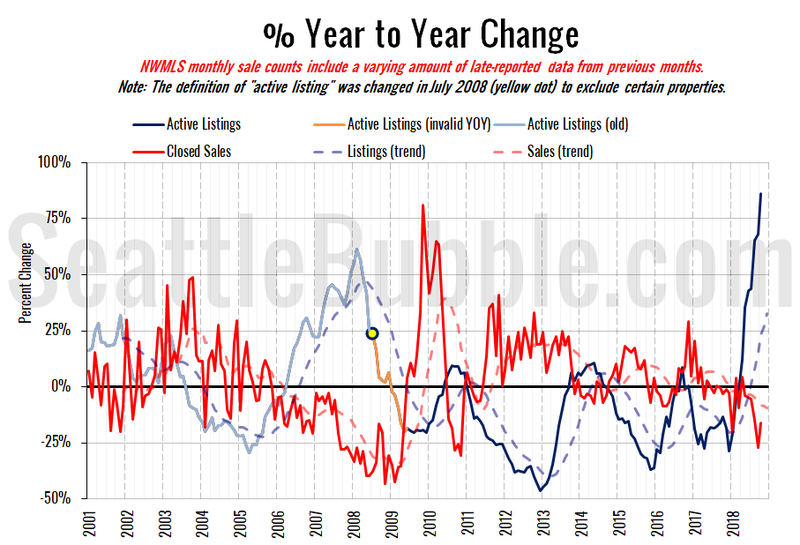 New listings were up five percent from a year ago, but began the usual seasonal decline month-over-month. Closed sales rose 12 percent between September and October. Last year over the same period closed sales dropped three percent. 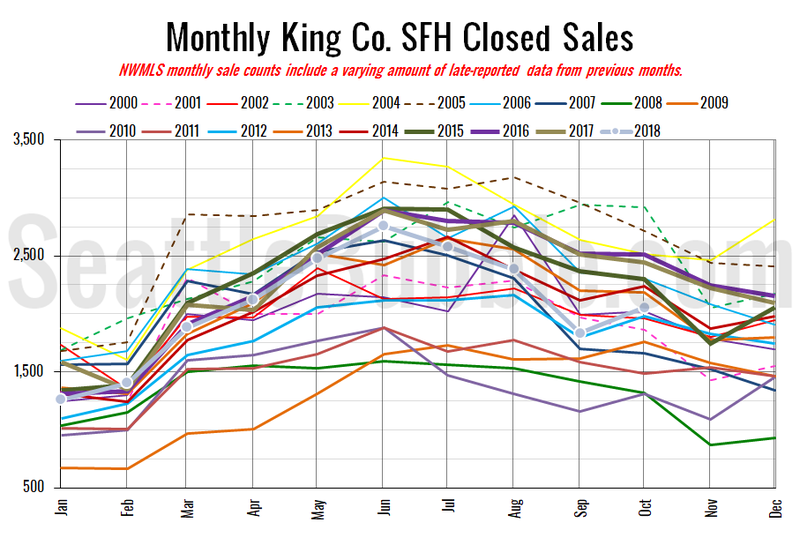 Year-over-year closed sales were down 16 percent. 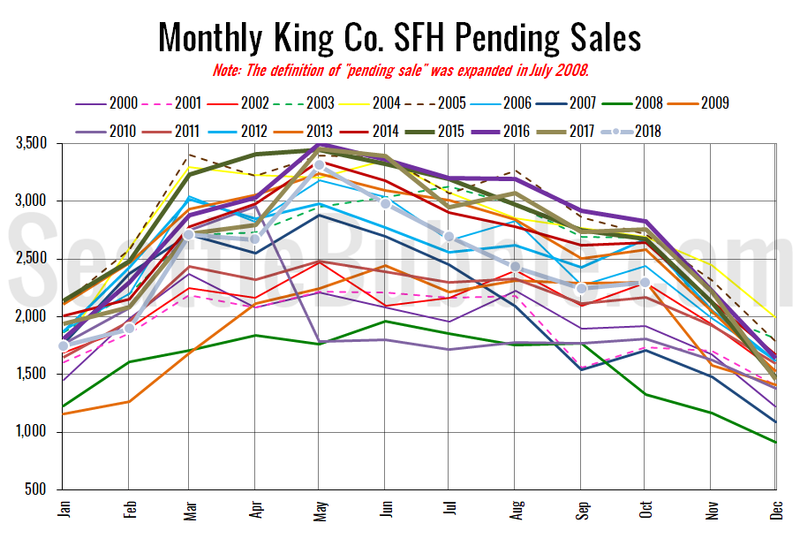 Pending sales were up two percent from September to October, and were down 17 percent year-over-year. For the last few months we’ve been charting new territory in year-over-year inventory growth. Year-over-year home price changes edged down from September to October. The Seattle Times hasn’t posted their story yet. I’ll probably update this post when they do. UWP, don’t be silly. The housing market doesn’t track every little blip, but RE does follow big stock market trends, like a sustained 25% dip in Amazon stock. Apply common sense. Sorry. I already explained to you why climbs are not RE related but drops are. Climbs in the stock market are only relevant at times when they counteract drops. There is no 1% person. Sometimes people just can’t understand one another. I’ll try to figure out how you misunderstood that. As to the 2010 thing, again Kary’s entire premise is incorrect as to what actually transpired in 2010. I can’t answer that while still on vacation because I have to run the 2010 stats to respond. I get back late tomorrow night. I’ll run the stats and respond when I get back to Kirkland from L.A. I’m typing with one finger on my phone at the moment. I’m going to enjoy my evening with my family and pick this back up when I’m back working. RE: Joe @ 750 – So by your logic, a three year lag is to be expected? Are you thinking before you speak..? I’ve read what you’ve said, I can see that it lacks logic. You are saying that stock market and RE are highly correlated if you time shift by a certain amount, except that the claimed lag is highly nonlinear (Ardell said 6 months, you corroborate with 3 year), which means mathematically they actually don’t correlate well. I don’t have anything to knee jerk about, you keep staying on the hot seat for nonsense. That comment makes no sense whatsoever. It was called to go down (in July/August) in February…and proved out to be correct in what is NOW, currently, hindsight. RE: Ardell @ 752 – Sounds good. I’ll wait for you to answer all those. So there we have it, stock market climbs don’t have correlation to RE climbs unless they counteract against each other in direction, only stock market drops do, and guessing about a 6 month lag. Joe, you should update your logic accordingly. And Ardell, hyperbole statements lead to questioning of motives. I think you misunderstood me for asking. Eddie you misunderstood me again. My model says stocks and RE are both tanking right now and will continue tanking. Interest rates are scheduled to be going up and not down for many years according to the Feds dot chart. Next interest rate hike coming up in two weeks, which will depress stock and RE prices further over time. This is not time to be buying Seattle RE. This is not the time to fight the Fed. As the Fed raises interest rates, house prices are sure to continue dropping. Ignore his telling you that you need to update your logic to mine. That’s silly. We all come at the question from different angles. Keep on keeping on. All roads lead to bearish at the moment. Keep walking your own path. That is again not correct. Stock market moves on a daily or hourly or weekly basis do not necessarily correlate to RE. You have to know when they do and when they don’t. The lag is not always 6 months either. I offered to answer one question when I get back and now you say “all those” questions. What “all those”??? I and others try to offer some info here. If we all get to bearish there is no need to slice and dice and prove and agree on every detail of how we all individually ended up there. The answer is if you don’t need to buy then don’t buy. If you do need to buy then be very careful about what you buy as the market won’t cover up your mistakes as it did if you bought in 2012. I don’t see how anyone can disagree with that so why is everyone fighting? If you agree the market is going down and will likely continue to do so through year end, why are you picking on everyone as to their method of how they arrived at that conclusion? You can’t open up an article these days that doesn’t agree with that conclusion. Why the arguments? Sorry for so many comments in a row. Trying to hit some of these old questions and general responses that don’t require me to do stats. I see now that you think when I give an opinion I need to prove to you where I get that opinion. No. I don’t. I’ll stop trying to appease you in that regard. People appreciate my doing that and so I do it but no, I don’t have the time to back it up to your satisfaction. As to my comments about Wharton, again you misunderstood. My point as to why I did that was in response to someone (maybe you) asking why I use the DOW. My explanation was that it is OLD school because I went to Wharton so long ago. I wasn’t bragging about going to Wharton I was acknowledging that it was so long ago in the early 80s that the teachings and my practices would not match anyone using more modern thinking. The beauty of many and varied opinions is we all approach it from a different angle with a different toolset. Mine are sharp…but old. Others are more modern. Together we add value, but only if people stop trying to be hurtful and vindictive. We have no reason to come here to add value so don’t take it for granted and stop beating it with a stick. Not just talking about me here. Everyone is trying hard to add value to the conversation about market conditions and future outlook. Appreciate that and let them have their say (probably mostly talking about Joe here). To some extent Just Me who does a lot of work on stats. None of us agree with everything everyone says. Sometimes you just need to bite your tongue and take what is of value to you and not beat people up if it doesn’t have value to you. No one here deserves that. We take our valuable time in an effort to help. Hopefully Tim will write another post soon so the bickering can stop, which always happens when the comment stream gets too long. I hope that explains my Wharton comment. I wasn’t dropping it in to brag. It was nothing to brag about. I happened to work down the street from Wharton and the bank I worked for paid for me to take all of the Economics and Management courses there. Not a big deal. Just noting it was in the early 80s. Hopefully that satisfies your need to understand the why of why I did that some time ago. Sorry you took it the wrong way. Maybe you can try harder to take things the right way as you seem to be misunderstanding many recently. Hope that’s not a sign you are having troubles in your life. Be well and lighten up. RE: Ardell DellaLoggia @ 745 – Jumping down throats? Chopping off heads? I am shocked. Justlook at the last conversation between Justme and myself. No doubt having noticed that people don’t frequently respond to my posts; Justme specifically directs the readers attention to them, and even makes them sound more interesting than they really are. In response, I thank him, and tell him that I think his graphs are pretty. I work extra hard to ensure that I met his dual wishes of no mis-characterizing of the facts, and no creating uncertainty. I thought we might be on our way to the altar. The Case-Shiller house price index for September (average of Jul-Aug-Sep) was published this morning. Another month-to-month (momo for short) drop. 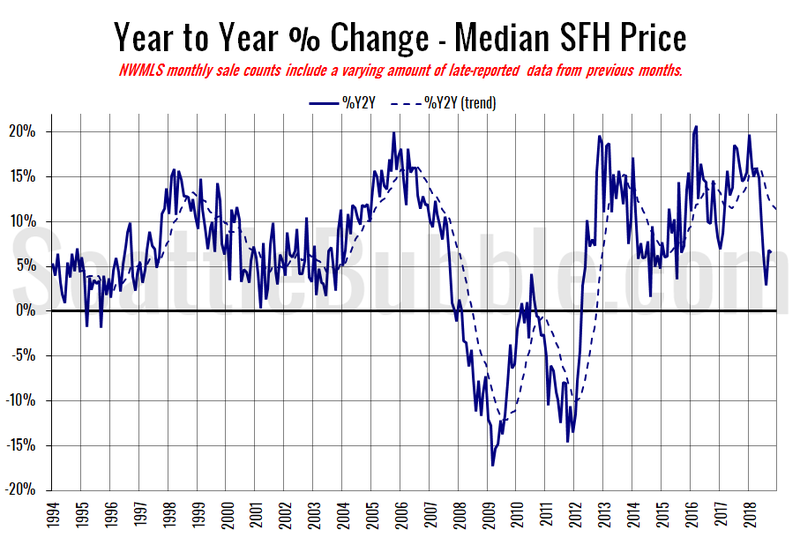 This is the third momo drop in a row, and the drops started during traditional “high season” for housing sales. RE: Ardell @ 758 – ah that one is on me, so actually it was Joe agreeing with you, rather than the othe way around on that train of thought. Well then that one was more of a poke a Joe. As for the arguments between many, you definitely misunderstood. the fighting hasn’t been about current equity market and RE declines in short term. It is the reasoning about how they are linked, that is why the projection is different long term. You have been adding from the numbers side, not so much on the actually debate we been having. If you want to add value there, go for it. You surely have read Joe’s belief that Fed rate impacts RE. He offers no further explanation ever, so I think he actually believes that Fed rate impacts mortgage interest rate or he is buying the whole Fed impacting equity market, and since its ‘high correlation’ with RE, RE must tank too. That is why I kept arguing with him because a false link means you can’t connect now to future. Seriously you really misread that one. To me Fed rate hikes increases equity market volatility, USD strength (worsen trade deficit), and compounded with oil volatility and trade war uncertainty, this is what the equity market is troubled. From RE, I see the threat from monthly balance sheet unwind that puts upward pressure on long term yield, that is driving the affordability equation. I think there is a gross underestimate of hiring and population growth in the area so I am not seeing the threat from demand side or price side if the wages continue to grow. Fed rate actually makes it harder for builders to justify building for profit so it would affect the supply side of equation. Then there is the possible dovish look if this equity market rout actually leads to anything tangible in employment report and GDP number. Joe wants to selll the whole Fed wants assets to be back in 2015 levels, and I think that Fed wants slow growth. We still have to compete with China to remain the dominant force, a recession is not the Fed’s goal. That is the big picture. Lastly, I haven’t wavered from the view of short term decline. I’ve been clear on that, looks like you are taking things all wrong. You got really sensitive there lol you see what happened when you got called out and then avoided the confrontation. I’m having no trouble in life, glad to see you still misunderstood people. Hopefully see you chime in on the actual debate however. Saying that people just misunderstood others isn’t catchy, I tried and it’s boring. When I see someone viciously attacking someone else relentlessly and then that same someone wants me to do them a favor and answer a question, I’m less inclined to oblige. What bothers me about Joe is he has no compassion for sellers. Yes, talk about the market and buyer benefit…but don’t be gleeful of a seller’s pain. It’s a particularly mean crowd at the moment…but true it gets that bad because the posts are infrequent and the comments go too long and sideways. RE: Ardell @ 763 – It’s tiring to hear Joe repeat the same flawed logic over and over, and then I repeat the same defense over and over. If you want to chime in on the Fed logic of this debate, that’s obviously up to you. I don’t need it, because I think that if you had it you would had talked about it already. I don’t take kindly to attacks, so I will only escalate rather than back down. Now if we want to talk some sense, I’m fine with going back to peaceful conversations. I don’t think that you will have nothing to gain or learn from this topic.